A coupling joins the drive and driven shafts in order to maximize power transmission and machine run-time. 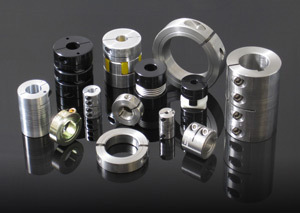 While they require shaft alignment and cannot be disconnected during operation, these devices allow for some flexibility for movement or misalignment and protect against overloads in the process. Examples include sleeve couplings, diaphragms, gear couplings that transmit between non-collinear shafts, and clamped couplings that form flexible sleeves around shafts. Shaft collars can perform many duties, mainly acting as mechanical stops, locators and bearing faces. Collar designs include those with set screws, clamp-style collars, and axial clamps which use a single nut and bolt around the shaft.